Since my house is never ever clean anymore, I began buying supermarket flowers. For some reason, this arrangement of monochromatic roses captures my attention even when it’s dying. Somehow the flowers detract from the sticky spots on the floor and the toothpaste splotched on the mirror. They make up for the soggy food at the bottom of the sink (we don’t have a garbage disposal, as I’ve been told) and the deeply soiled clothing that is always dirty even when every last bit of laundry has been done. Often I feel like all I do is clean. (And for some reason, probably because of the babies, I’m always doing it sober which doesn’t help.) I can’t figure out how the moms who have clean houses and happy children do it. So I buy flowers. 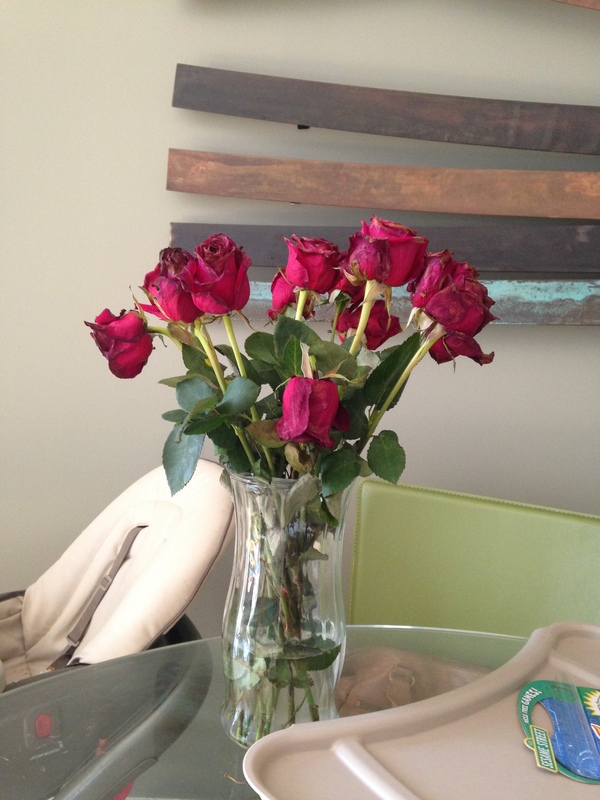 They bring deliberate beauty into my home, even as they wilt. And most days, this planned pretty reminds me to relax.